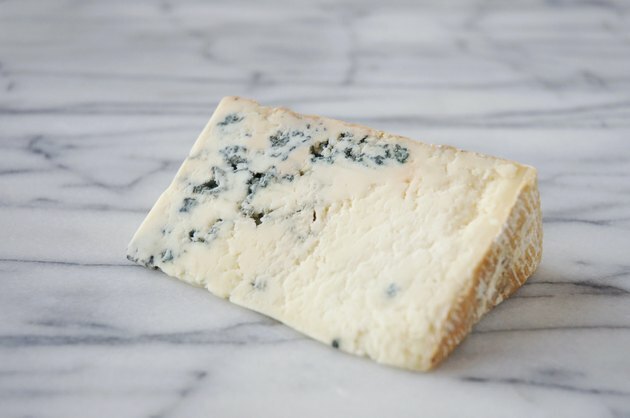 Gorgonzola is a type of Italian blue cheese that is easy to crumble. It is often added to salads and it comes from either cow's milk or goat's milk. If you are looking to add this food to your diet, it is good to know the nutrient profile. Fat is one of the three macronutrients. Gorgonzola cheese contains 8 g of total fat and 6 g are saturated. Eating too much saturated fat is one of the major risk factors for heart disease according to the National Institutes of Health. All forms of dairy products are generally high in calories, and Gorgonzola cheese is no exception. A 1/4 cup contains 100 calories. People following a low carb diet resort to eating foods that are high in protein and low in carbs. Gorgonzola cheese is an example of one of these foods. It only contains 1 g of carbs per 1/4 cup and 6 g of protein. Sodium is an important electrolyte mineral, but it can have a negative effect if you take in too much. High-sodium diets are linked to an increase in blood pressure and a higher risk for heart disease and stroke according to the American Heart Association. A 1/4 cup of Gorgonzola contains 380 mg of sodium. Diary products are high in calcium which is important for strong teeth and bones. A 1/4 cup of Gorgonzola contains 15 percent of your daily allowance.